Can Farang ever be Thai? Thailand’s funniest cross-cultural game show, the Singha Taste of Thailand Challenge, hits the road again this November and December in pursuit of the answer to the question: Can farang (that’s western folk) ever truly behave like Thais? Whether they can or not, the efforts are hilarious as tourists and travellers (and the occasional foolhardy expat) compete against each other to win the hearts and minds of the Thais in the audience and win travel-related incentives, by making fools of themselves. This funky, tourism-promotion event opens its northern leg at Chiang Mai’s Riverside on Friday 24 November then heads to Pai for a show at BeBop on Sunday 26 November. Both events will feature live music from Thai reggae allstars T Bone and local rockers Tonic Rays, with Joe Cummings of Lonely Planet infamy on guitar. The entire nationwide tour will be filmed and broadcast internationally on Star World TV, UBC and cable channel’s nationwide. In addition the event is supported in print by Bangkok Post, Untamed Travel and locally by Chiangmai Mail, City Life and Pai Post. 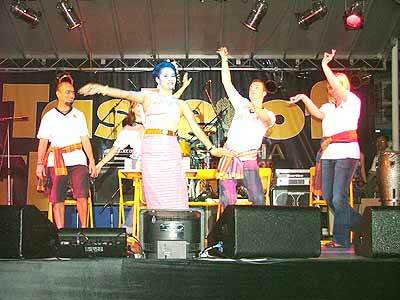 “We’ve got a great show this year,” said the event emcee Worathep na Banglampu. “We had such fun last year and got a huge response from mates around the region who saw us on the telly that we’ve decided to tighten things up a little bit. We’ve added a few surprises to the game show and our guests artists are two of the best live bands in Thailand. The Singha Challenge is like an alternative to the pub - down the pub,” added Worathep. If you will be around for the event, seeking that ‘fifteen minutes of fame’ and quite frankly, could do with a few of the freebies, simply answer the following questions about the Land of Smiles and you could end up onstage in front of hundreds at the Singha Taste of Thailand Challenge. Anyway, that’s all the info. The rest, as they say in Thailand, is up to you. See you in the North! The Christmas season is traditionally a time of gift-giving. The Angel Tree Project is an initiative of Operation Blessing Foundation Thai, to provide the local Chiang Mai community with the opportunity to give Christmas gifts to needy children who would otherwise receive nothing. 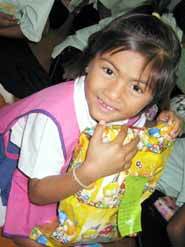 A smiley angel receives her present, supplied by a generous donor. By the November 7, Christmas trees or “Angel Trees”, will be placed in Chiang Mai at Carrefour, Central Airport Plaza, Chiang Mai International School, Grace Academy, Thammaprateep Church, and at the First Church in Lampang. Each of these Angel Trees will be decorated with paper angels. The angels will have a photo and profile of one of the 700 sponsor children from Om Koi District in Chiang Mai and Vieng Sa District in Nan Province, who will receive a Christmas gift this December, possibly for the first time in their life. The Angel Tree Project has been running for five years and has provided more than 3,000 needy children with a little slice of joy at Christmas. This is largely due to the generosity and kind donations of so many in the local community. If you would like to be a part of the Angel Tree Project this year, please visit one of the above locations and choose a child to bless this Christmas. Once you have chosen, simply purchase a gift from a list of suggested items, wrap it up and place it back under the Angel Tree with the child’s card attached. Hello Kitty brings joy to a sponsor child in last year’s Angel Tree Project. If you would like to give but don’t have the time to shop, you can place a 200 baht donation with the child’s card, in the donation box near the Angel Tree. Operation Blessing will then purchase a gift on your behalf. All donations and gifts must be received by December 2. On the December 9 in Hvey Na Ngew Village, Nan Province, and on the 15th of December in Chi Bae Village, Chiang Mai Province, Operation Blessing staff will put on Christmas parties for all of the sponsor children. It will be a fun-filled day with games, food and lot of presents from all of the sponsors, to help make this Christmas season a joyful one they will never forget. Operation Blessing Foundation (Thai) is a non-profit Christian organisation with a mission to provide through humanitarian services to economically disadvantaged people and communities, and to victims of disasters. Operation Blessing’s charitable activities include medical missions, food distribution programs, fresh water wells, community assistance projects, and disaster relief operations. For further information contact: Karen Thomson, director, tel: 053-262940 / 08 18832341 or Tim Daniell, research and reporting, tel: 053-262940 / 08 62243220. 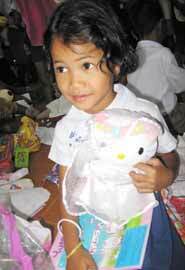 A young Karen child from Mae Sariang receives her first Christmas present. 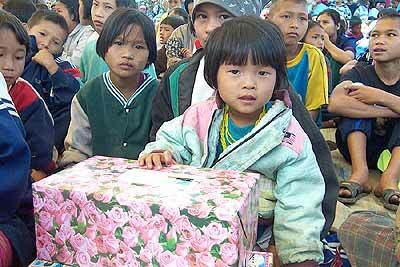 Gifts for sponsor children during OB’s 2005 Angel Tree Project.